In addition to Apply to each now being supported, you can also use any other actions that work with arrays, such as Select or Filter inside of Apply to each actions. One additional note, the Add Dynamic Content menu will only show items from one level of arrays, so if you want to access these nested items you'll need to add an Apply to each first, and select the array before you can use the item. Please note that the run history view cannot currently show the outputs from inside of nested apply to each. 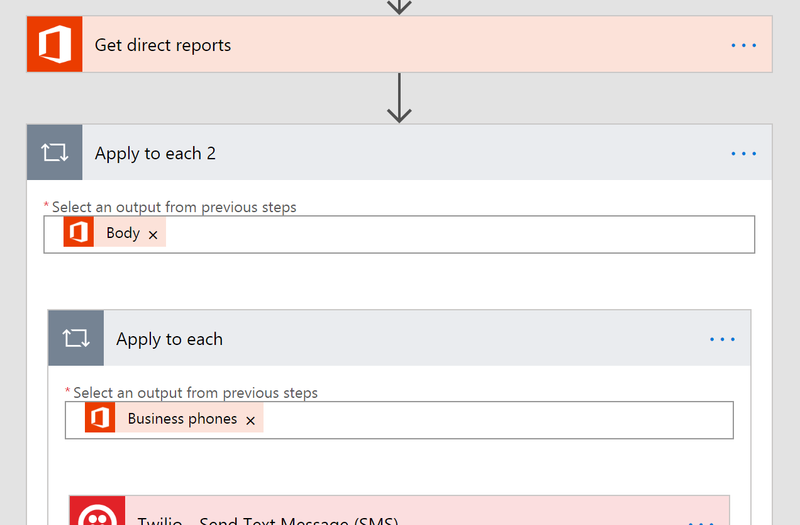 There were several suggestions on the ideas forum asking for actions to work with Dates and Times inside of flows. This week, there is a new set of actions that address many of these ideas: create a relative date, for example a time in the past or the future, get the current time as a action, convert times to Local time, and use date time expressions. 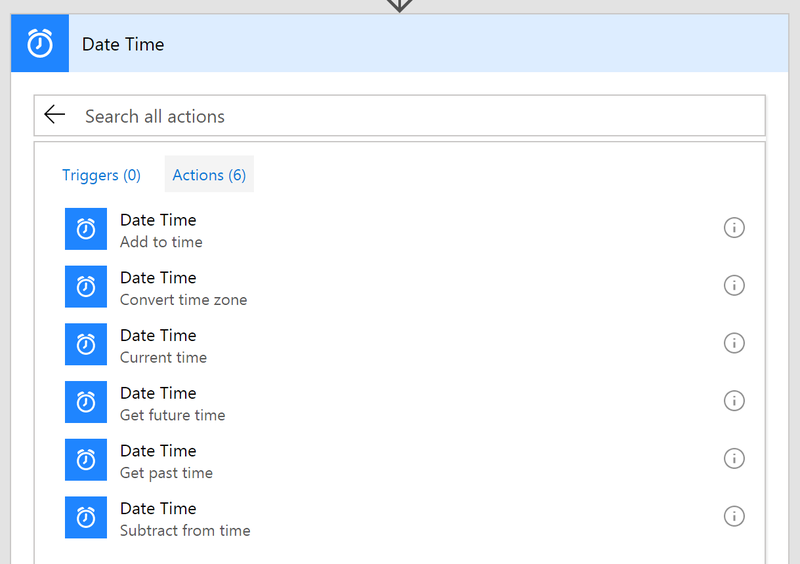 To get started with these new actions, just select the new Date Time connector. There you will see all of the actions, which help you to convert time zones to format them for local time in an email, add or subtract times, or just get the current time. Each of these actions allow you to choose the format the of timestamp, so if you have another service that expect the time in a certain format you can configure that. In addition to these six new actions, there are also expressions that you can use inline in other actions to do the exact same things that these actions do. Docparser – Extract data from PDF files & automate your workflow with our reliable document parsing software. Microsoft Kaizala – Microsoft Kaizala is a mobile app that helps you connect with your entire mobile workforce and supply chain, organize and allocate tasks more efficiently with built-in and custom Actions, and get actionable information and insights to accelerate decision-making. Pitney Bowes Data Validation – Pitney Bowes Data Validation Services helps eliminate errors in data and improve customer experience. It makes communication easier, faster and effortless by enriching customer details, keeping it up-to-date and maintaining its accuracy and consistency. To learn more, visit the documentation page: https://aka.ms/kvz9oh. Microsoft Flow sends out notification emails when you have a flow that fails, but it's possible miss these. 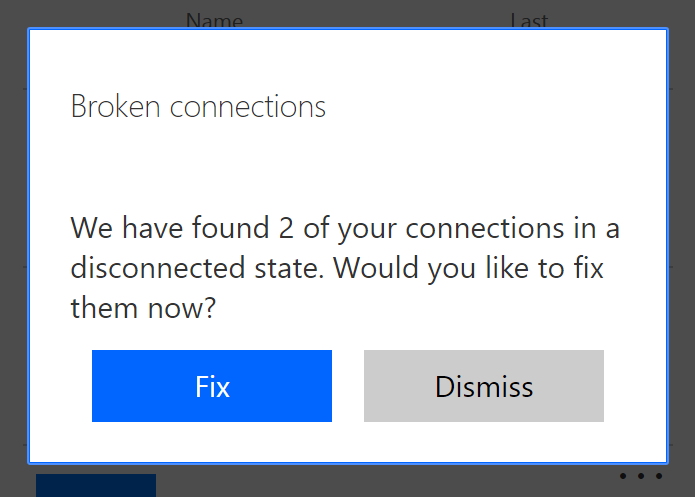 To let you know if you have any connections that are not working, we will now notify you directly in the Microsoft Flow portal when you log in. Just click on Fix and you will be taken to a new page that shows you all of your connections, along with their status. The new connection page has been improved in other ways — you can now search your connections, and, get more details about your connections, like what PowerApps and flows are using that connection. You can even share certain connections and see who has access to them. You can now define buttons that take files (for example, photos from your phone) as inputs, or email addresses. There is a new On-the-go template collection. Buttons on the mobile phone will remember your recent inputs for quick triggering. The mobile app has a much improved first-run experience, including the ability to seamlessly sign you in to Microsoft services without requiring you to re-enter your credentials. Improved activity feed to include more detailed run summaries and troubleshooting details. You can read more about these features in Adi's blog post here.